Maybe you have difficulty maintaining relationships due to angry outbursts you can’t control. Perhaps you haven’t been able to go to work for the past few days because you can’t get out of bed. You might be having intrusive, anxious thoughts that are preventing you from feeling safe anywhere you go. You know these symptoms are a problem, but you don’t know their source, and they point in the direction of several different potential psychological disorders. This is where psychological testing comes in. Psychological testing, also known as psychological assessment, is a tool used by psychologists to diagnose and guide treatment for their patients. These tests are designed to measure an individual’s behavior and other dimensions of their personality to better understand issues related to interpersonal relationships, emotions, and thinking patterns. 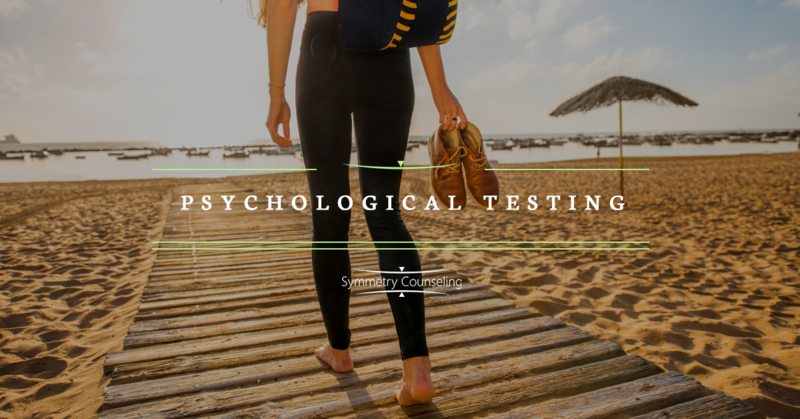 If you are experiencing issues that could be contributed to several different sources, psychological testing gives your therapist a way to diagnose you and connect you with the right treatment. For example, a person struggling to complete tasks around the house may undergo an assessment to understand if there is a psychological diagnosis that helps explain behavioral patterns. Tests are standardized, meaning test takers are evaluated in a similar or “standardized” way. Additionally, they are often norm-referenced, meaning test scores are compared to a selected set of test takers based on factors such as age or grade level. We often use these helpful tools at Symmetry Counseling to connect our patients with what they need to live healthier lives. What Does Psychological Testing Involve? Psychological testing typically takes place in three phases. During the first contact, the clinical psychologist will meet with the patient for an initial in-depth interview to gather a thorough history. The purpose and reason for testing will also be discussed, along with the patient’s expectations about the testing process. During the second phase, the psychologist will administer tests. This may include a combination of computerized tests along with oral and written measures. Tests chosen will vary depending on the patient’s needs and referral requests. At Symmetry Counseling, we commonly test for Attention-Deficit/Hyperactivity Disorder (ADHD). ADHD is a common mental health disorder that predominantly impacts children and teens, though it can continue into adulthood. It is characterized by inattention (inability to concentrate), hyperactivity (excessive and disruptive movement), and impulsiveness (hasty decision-making without thought). ADHD can cause major problems for both children and adults at home and at school or work because they can't focus for long periods of time or stay organized. Fortunately, it is possible to manage this condition with medication and therapy. Due to how debilitating this disorder can be, at Symmetry Counseling, we are committed to providing you with the ADHD testing you need to help connect you with the right treatment. Whether you believe your child has ADHD or you suspect you might, we can help you. While there is no single genetic test for ADHD, through a battery of checklists and rating scales as well as a thorough history from family members, we can diagnose and determine the right course of action for treatment. In some cases, a neuropsychological assessment may be needed. Neuropsychological assessment refers to testing specific cognitive functions and behaviors to understand brain functioning. Functions of the brain that are assessed may include memory, attention, visuospatial processing, language abilities, and executive functioning. Neuropsychological assessments are often conducted in the presence of brain damage or to better understand a neurological illness, such as dementia. If you need psychological testing in the Chicagoland area, contact Symmetry Counseling. We know that when you are not feeling mentally healthy, it’s hard not to give into feelings of hopelessness and loneliness. When you are experiencing symptoms of a psychological disorder, you need the help of a compassionate and experienced mental health professional. Symmetry Counseling is committed to providing high-quality and timely psychological evaluations designed to assess emotional, behavioral, and/or learning challenges. We understand that problems can be complex and tough to fully understand and work through alone. Our licensed clinical psychologists who administer testing are similar to a detective looking for clues to help solve a mystery. Psychological assessment may be especially helpful to gain insight into your questions, provide specific treatment options, and offer professional diagnostic expertise in appropriate treatment planning and coordination of care. Psychological assessment provides valuable information about an individual and may be an important step in helping to get a better handle on the difficulties you are facing today. Do you believe that you would benefit from psychological testing? We would love to help you. To begin the assessment process, contact us for intake. After the intake, a licensed clinical psychologist will administer a 90-minute, in-person diagnostic interview; this is an integral part of the assessment process as a means to rule-out medical or psychological conditions or concerns. The diagnostic interview will allow the psychologist to gather information on the following: the reason for referral, developmental history, health and psychiatric history, education and employment history, social history, childhood and family history, and alcohol/drug history. The assessment itself typically consists of one four-hour appointment that includes a variety of tasks and tests to measure attention, memory, intellectual functioning, personality, mood, and emotional functioning (approximate time may vary according to individual needs). The licensed clinical psychologist will analyze, evaluate, and summarize the assessment results, and discuss results with you during a one-hour feedback session. The feedback session is inclusive of individual test results, diagnosis, and detailed treatment recommendations that are designed to help you decide the best steps to take in getting back on track with your goals. Fees for psychological assessment are based on the specific battery of tests used. Insurance will often cover a portion of these services, and we work with your insurance company to pre-certify coverage of the assessment. If you live in Chicago and would like to learn more about our psychological testing services or would like to schedule an appointment, contact Symmetry Counseling today.